1. Wool resists wrinkles - wool is like a spring, it has a natural crimp that allows it to return to its natural shape even after being stretched by up to 30%. Its complex coiled structure gives it great resilience against becoming flat and hard, so you can count on wool to keep its shape. 2. Wool has balanced thermal insulation properties - meaning it is warm in winter and cool in the summer. 3. Wool is hypoallergenic - it is resistant to bacteria, mould and mildew that can trigger allergic reactions in many people. 4. It absorbs harmful pollutants - not only does wool absorb many harmful pollutants from the air, it does not re-emit them. It's estimated that wool used in interiors can help purify the air for 30 years. 5. Dust mites don't like wool - dust mites need moisture to survive. Wool has microscopic pores that respond effectively to changes in humidity making it unfavourable for the growth and breeding of the house dust mite. Dust mite allergens are one of the triggers for asthma attacks. 6. Wool is naturally anti-static - wool generates very little static electricity because of the qualities of its natural fibres. Static attracts lint, dirt, and dust, so its anti-static properties keep it much cleaner for longer. 7. Easily cleaned - wool fabrics clean easily because the outside surface of the wool fibre consists of a series of overlapping scales (similar to the feathers on a bird), which means that dirt sits on the surface of the fibre, making it easy to remove. 8. Wool is naturally flame resistant - wool is difficult to ignite, has low flame spread and heat release properties; it does not melt and has superior self-extinguishing qualities. 9. Wool is a naturally renewable fibre - what could be more natural than wool? Each year sheep produce a fleece, which makes wool a natural and renewable resource. 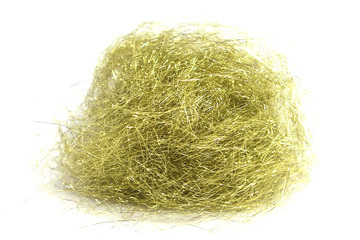 As yet, no one has been able to reproduce the properties of wool synthetically. 10. Eco-friendly and Sustainable - when it's 'out with the old' wool will naturally biodegrade. It is a totally natural product, entirely renewable and sustainable. And it is 100% biodegradable - a very important feature in a world that is increasingly concerned about the environment. 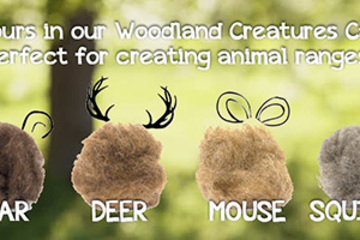 Our woodland creatures range is made up of varying shades of browns to imitate animal tones. 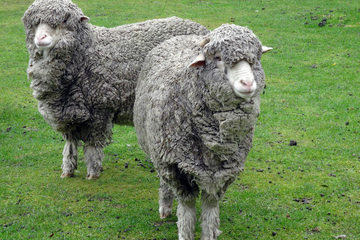 It is produced from Corriedale Fleece, approx. 29/30 Microns. It is perfect for needle felting animals. The WoW guide to Christmas colours. If you're starting to think about what to make over the festive period, we have the perfect colours for your Christmas project. 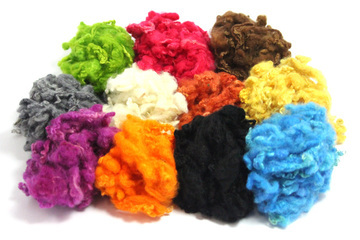 Dyed Curly Wool Locks - Now Available!!! Due to popular demand we have launched a range of dyed wool locks in 10 different colours along with natural white. Check out the 'Wool Locks' section to see the full range. Here at World of Wool it's quite obvious that we love wool! From the curly Wensleydale to the proud Blue Faced Leicester, we really do love every breed; but we have to say there is a special place in our hearts for Merino.